If you need a better efficiency than standard 16 oz. polyester will provide, but don’t need the ultra-high efficiency of SlyHe (High Efficiency) or a PTFE membrane bag (SlyTex), try our 16 or 18 oz. /yd2 duo-density polyester felt (SlyMax). 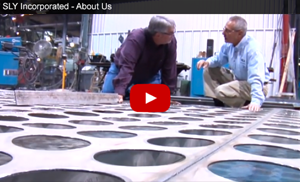 You may be able to reach the efficiency you need and not have to spend a lot more on your filters. SlyMax is a true duo-denier felt with a finer denier fiber blend on the surface or collection side of the felt and a larger denier fiber on the inside. The two different sized fibers are separated and supported by a scrim in the middle unlike many of our competitor’s unsupported felts which are produced in a single process that makes the fibers are a homogeneous blend. The SlyMax has a scrim support which provides dimensional stability and a densifiied central core which improves filtration efficiency by minimizing dust migration through the felt. 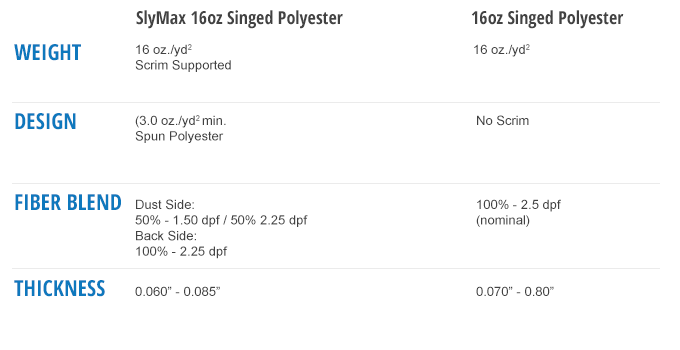 SlyMax duo-density polyester is a true 16 oz. /yd2 weight felt versus the majority of commodity unsupported felts, which are actually targeted and manufactured to be 15.5 oz./yd2 or even 15 oz./yd2 in weight. Available Finishes for Duo-Density PE: Singed (SI); See detail information on finishes here.